One of the challenges of wedding photography is making sure you create romantic images for your couple. This is not always easy and it can largely depend upon the couple. Some brides and grooms are not comfortable with outward displays of affection in a public places. Others actually need no encouraging and love to pose for the camera and help us create the proper mood. We feel it is important to feel out our couples before the shoot to figure out what they want with their wedding photography. We never push our couples into posing in a way that makes them uncomfortable. So here again, good communication between the photographer and the subject is imperative. 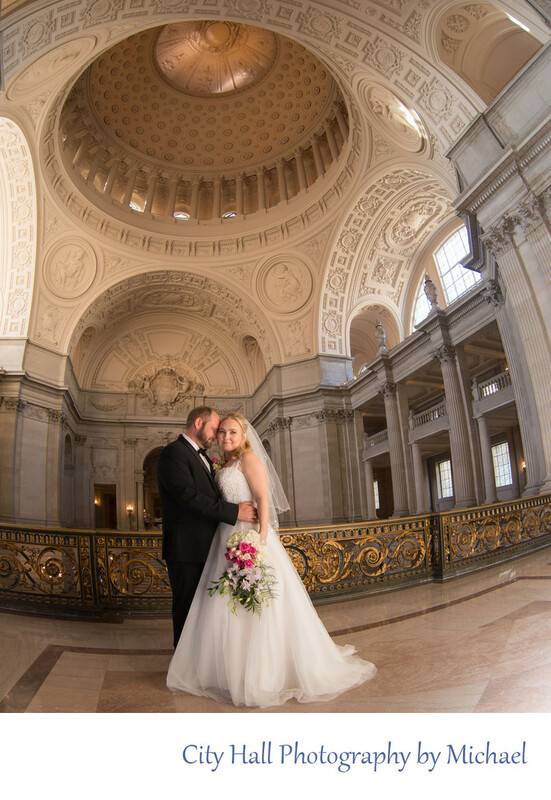 San Francisco City Hall presents unique challenges for a wedding photographer trying to capture the above mentioned romantic images. Why? Well, unlike a typical weekend wedding, the bride and groom's portrait session occurs in a public building loaded with tourists and other couples. We don't often face this on a typical weekend wedding. Usually when it comes time to photograph "the formals" we take the couple aside and do a series of wedding photos in various places. Most of the time, these locations are private when it comes to weekend weddings. This gives the couple more freedom be themselves. City Hall does not provide this privacy, so we try very carefully to pick our spots for the more romantic images. The fact is, we know some of the best wedding photography locations in the building that provide the needed privacy combined with a beautiful background.